Overview: Fiat-Chrysler (FCA) has reintroduced the storied Alfa Romeo to America — to rave reviews. We’ve driven this vehicle twice, and enjoyed it both times — once at the Northwest Automotive Press Association’s Run to the Sun event and again recently as part of our regular week-long rotation. Walkaround: The 2018 Alfa Romeo Stelvio Sport AWD SUV boasts striking Italian styling — inside and out. The classic trilobo grille is a mirror image of the Giulia but looks even better sitting higher off the ground on the Stelvio. 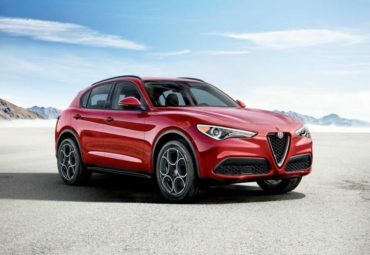 The sleek roofline makes it look more sedan-like than crossover, and the Stelvio features 20-inch wheels too beautiful to take off road. The rear hatch features an interesting indentation molded into the liftgate, sort of like a Lexus, only different. Interior: The Stelvio’s cabin is a nice place to be on a road trip. Its standard heated leather seats are comfortable, form-fitting, and just feel elegant. On our test driver, the upscale TI model, the trim is wood and aluminum, with minimal hard plastic. The stop-start button has a unique location, however, the infotainment controls — which include Apple CarPlay and Andriod Auto — feel somewhat misplaced. The back seat is small — even for kids — with just 32 inches of legroom. Headroom is about average for the class, as is the 8.5 cubic feet of cargo space, which becomes 56.6 with the rear seat folded.. Under The Hood: The 2.0-Liter turbocharged four-banger delivers a very athletic 280 horses and 306 lb.ft. of torque — besting some V-6’s from segment competitors. Also available is a hot 505-horse twin turbocharged V-6. Both are married to an efficient 8-speed automatic. Front wheel-drive is standard, AWD optional. Behind The Wheel: The driving dynamics are just excellent, with precision 50/50 balance and a tight, agile suspension. Steering is quick and handling is responsive. The 280-horse I-4 delivers muscle car-like acceleration. The Stelvio is the most fun flying down an open road — in spite of its ample foul weather, AWD capabilities. Bottom Line: The 2018 Alfa Romeo Stelvio Ti Sport is the SUV adaptation of the exhilarating Alfa Guilia sport sedan. It delivers ample functionality, athletic performance, creature comforts, style — and affordably puts “Sport” in the midsize Sport Utility segment.